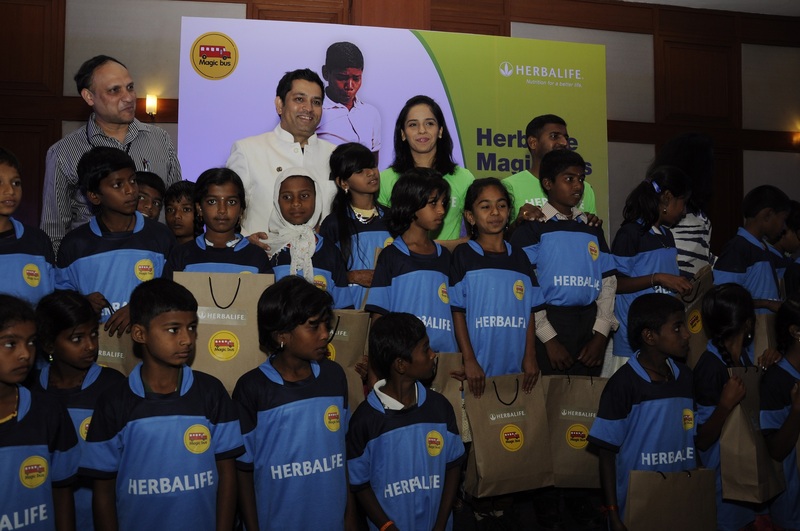 Bengaluru,January 8, 2015 – Herbalife International India Pvt Ltd, a leading nutrition company today announced its partnership with the Magic Bus India Foundation to reach out to 3,000 underprivileged children across Bengaluru, Chennai and Pune to help support their development through sports and education. 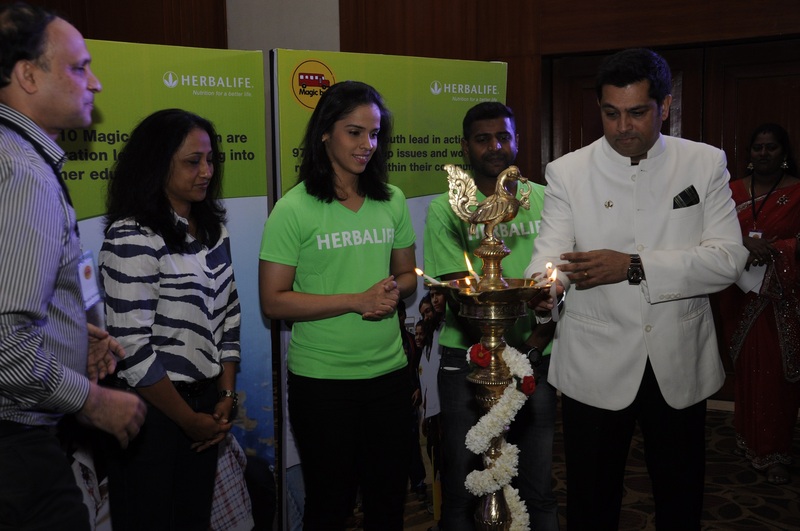 Indian badminton ace, Saina Nehwal and paralympian H.N Girisha inaugurated the launch of the partnership programme, held today in Bengaluru. The one-year partnership will witness Herbalife join hands with the Magic Bus India Foundation to improve lives of a total of 3,000 children from poor neighborhoods — four slums in Bandepalaya, Hosur Road in Bengaluru, three slums at Vyasarpadi, Perambur in North Chennai and three slums at Hadapsar in Pune — under the Foundation’s ‘Adopt a Community’ – Sport for Development programme. Aimed at helping children move out of poverty, the programme focuses on the vital inputs of education that uses sports as the medium, personal and community healthcare, gender equality and better livelihood to ensure that young people make the right choices from childhood all the way through to gainful employment. In addition, the partnership will also support 150 children and 25 youths to train and excel at football under the Foundation’s Sports for Excellence programme. 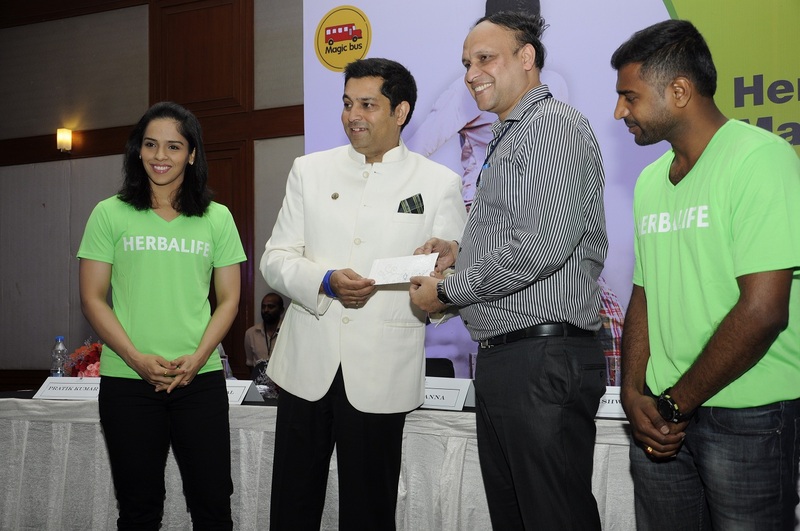 Herbalife is associated with leading sports personalities such as Virat Kohli, Saina Nehwal, Mary Kom, Dipika Pallikal, Heena Sidhu and H.N Girisha to spread the message of healthy and active living supported by good nutrition, across all age groups in India. Herbalife is a global nutrition company that has been changing people’s lives with great products since 1980. Our nutrition, weight-management, energy, sports and personal care products are available exclusively to and through dedicated Independent Herbalife Associates in more than 90 countries. We are committed to fighting the worldwide problems of poor nutrition and excess weight by offering high-quality products, one-on-one coaching with an Herbalife Associate and a community that inspires customers to live a healthy, active life. The company has over 7,400 employees worldwide, and reported net sales of $4.8 billion in 2013. To learn more visit herbalife.com. Magic Bus (www.magicbus.org) is a non-profit organization working with more than 250,000 children from some of India’s poorest neighborhoods. At Magic Bus, we move children out of poverty by nurturing them on a journey through from childhood to livelihood. We focus on the vital inputs of education, personal and community healthcare, gender equality and livelihood to ensure that young people make the right choices from childhood all the way through to gainful employment. Local community leaders are trained to deliver an award-winning curriculum that uses sport as a metaphor to address complex development issues through the formative years of a child’s life. Every participant is offered a livelihood programme which focuses on ensuring young people actually get a job. To learn more, visit magicbus.org.